8079 food and pharmaceutical grade packaging aluminum foil greatly reduces the gas permeability and oxygen permeability in food and medicine packaging industry. High quality aluminium foil 8011 8021 8079 can be widely used in the field of aluminum foil for food and medicine, effectively improving the shelf life of food and medicine product inside. 8079 aluminum foil is a kind of aluminum foil with high strength, good elongation and good stretchability. 8079 aluminum foil not only has the advantages of moisture-proof, air-tight, shading, abrasion resistance, fragrance preservation, non-toxic and tasteless, but also because it has elegant silver-white luster, it is easy to process beautiful patterns and patterns of various colors for packaging. 8079 aluminum foil is widely used in food packaging, pharmaceutical packaging, battery soft packs and other fields. The strength of 8079 food and pharmaceutical grade packaging aluminum foil can reach 90-110Mpa, extension is 13%-18%, cup protrusion is 6.2-7.3mm, and the surface is free of oil, pinholes, bumps, scratches, oxidation, foreign matter wrinkles, etc. Online pinhole detector and ultrasonic welding are adopted on device configuration to meet the cutting process of a series of high-end products such as battery foil, electronic foil, food container foil and medicine foil. 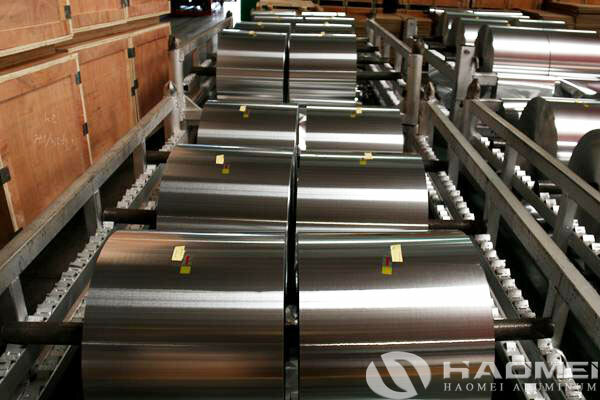 The material rack is loaded with 5-layer material rack to effectively improve the surface cleanliness of aluminum foil.